Located on the Puget Sound of Washington, Gig Harbor is a unique community first established as a fishing village. The focus of the town is the water which tucks around the hills and the houses overlooking it, while Mouth Rainier, a 14,411 foot snow-capped mountain rises in the background. Today, Gig Harbor is also known for its assortment of unique shops, restaurants, and art galleries along Harborview Drive. There are also three state parks within a few miles of town. Named by Commander Charles Wilkes, who dispatched a small boat (or “gig”) to survey the area, the town was founded in 1886. Much of its history has been connected to boat building and fishing. 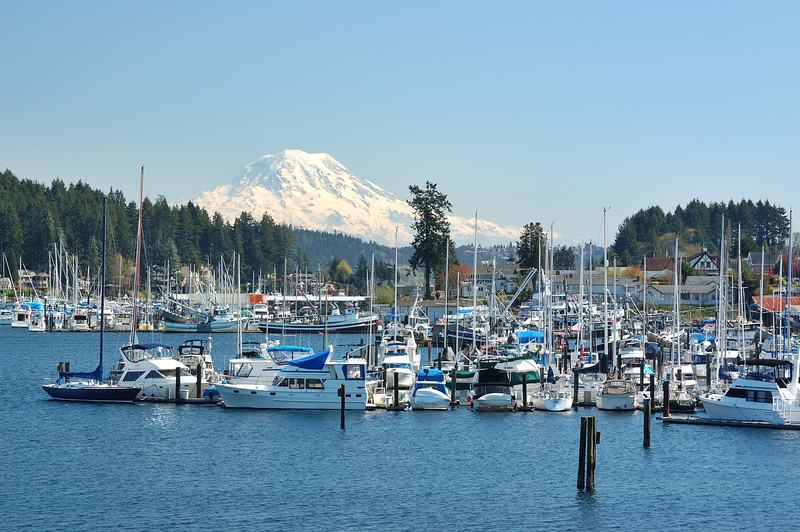 An ideal destination for the boater, Gig Harbor offers excellent anchorage and 24-hour moorage at the public dock and nearby marinas. Other important features of the Gig Harbor / Peninsula area include, complete medical facilities for urgent care and same day surgery, the Tacoma Narrows Airport and three new full service lodging facilities. The Gig Harbor Peninsula School District is ranked the highest in Pierce County, providing many athletic and extra curricular activities for children residing in the area. Whether you bird watch, garden, sail, hike, fish, golf, you will love the lifestyle of the Gig Harbor area.